A collection of quotes from non-Muslim and non-Islaamic publications about Islam, the Qur'an and Muhammad. Professor Keith Moore, one of the world’s prominent scientists of anatomy and embryology. University of Toronto, Canada. "It has been a great pleasure for me to help clarify statements in the Qur’an about human development. It is clear to me that these statements must have come to Muhammad from God, or 'Allah', because almost all of this knowledge was not discovered until many centuries later. This proves to me that Muhammad must have been a messenger of Allah." "But Islam has a still further service to render to the cause of humanity. It stands after all nearer to the real East than Europe does, and it possesses a magnificent tradition of inter-racial understanding and cooperation. No other society has such a record of success uniting in an equality of status, of opportunity, and of endeavours so many and so various races of mankind . . . Islam has still the power to reconcile apparently irreconcilable elements of race and tradition. If ever the opposition of the great societies of East and West is to be replaced by cooperation, the mediation of Islam is an indispensable condition. In its hands lies very largely the solution of the problem with which Europe is faced in its relation with East. If they unite, the hope of a peaceful issue is immeasurably enhanced. But if Europe, by rejecting the cooperation of Islam, throws it into the arms of its rivals, the issue can only be disastrous for both." --H.A.R. Gibb, WHITHER ISLAM, London, 1932, p. 379. Professor William W. Hay is one of the best known marine scientists in the United States for satellite photography and emote-sensing techniques. Professor Hay replied: I find it very interesting that this sort of information is in the ancient scripture of the Holy Qur’an, and I have no way of knowing where they would come from, but I think it is extremely interesting that they are there and that this work is going on to discover it, the meaning of some of the passages. Professor Hay: Well, I would think it must be the divine being! Professor Yushudi Kusan: Director of the Tokyo Observatory, I can say, I am very mush impressed by finding true astronomical facts in the Qur’aan. Professor Alfred Kroner who is one of the world’s most famous geologists: "Thinking about many of these questions and thinking where Muhammad came from, he was after all a bedouin. I think it is almost impossible that he could have known about things like the common origin of the universe, because scientists have only found out within the last few years with very complicated and advanced technological methods that this is the case. Dr. T.V.N. Persaud is a Professor of Anatomy and Head of the Department of Anatomy, and a professor of Pediatrics and Child Health, University of Manitoba, Winnipeg, Manitoba, Canada. He is the author or editor of 25 books, and has published over 181 scientific papers. In 1991, he received the most distinguished award presented in the field of anatomy in Canada. "It seems to me that Muhammad was a very ordinary man. He could not read or write. In fact, he was illiterate. We are talking about 1400 years ago. You have someone who was illiterate making profound pronouncement and statements and are amazingly accurate about scientific nature. I personally cannot see how this could be mere chance. There are too many accuracy’s and, like Dr. Moore, I have no difficulty in my mind in concerning that this is a divine inspiration or revelation which led him to these statements." Joe Leigh Simpson, Professor of Obstetrics and Gynecology at the North Western University in Chicago in the United States of America. Professor Simpson said: It follows, I think, that not only is there no conflict between genetics and religion, but in fact religion can guide science by adding revelation to some traditional scientific approaches. That there exists statements in the Qur’an shown by science to be valid, which supports knowledge in the Qur’an having been derived from Allah. Professor Palmer a scientist from the U.S.: We need research into the history of early Middle Eastern oral traditions to know whether in fact such historical events have been reported. If there is no such record, it strengthens the belief that Allah transmitted through Muhammad bits of his knowledge that we have only discovered for ourselves in recent times. We look forward to a continuing dialogue on the topic of science in the Qur’an in the context of geology. Thank you very much. Professor Armstrong, Scientist works at NASA, "I am impressed that how remarkably some of the ancient writings seem to correspond to modern and recent Astronomy. There may well have to be something beyond what we understand as ordinary human experience to account for the writings that we have seen." Professor Dorja Rao, "It is difficult to imagine that this type of knowledge was existing at that time, around 1400 years back. May be some of the things they have simple idea about, but do describe those things in great detail is very difficult. So, this is definitely not a simple human knowledge." "I have studied him - the wonderful man - and in my opinion far from being an anti-Christ he must be called the saviour of humanity. " George Bernard Shaw in "The Genuine Islam"
"Muhammad, the inspired man who founded Islam, was born about A.D. 570 into an Arabian tribe that worshipped idols. Orphaned at birth, he was always particularly solicitous of the poor and needy, the widow and the orphan, the slave and the downtrodden. At twenty, he was already a successful businessman, and soon became director of camel caravans for a wealthy widow. When he reached twenty-five, his employer, recognizing his merit, proposed marriage. Even though she was fifteen years older, he married her, and as long as she lived, remained a devoted husband. "Like almost every major prophet before him, Muhammad fought shy of serving as the transmitter of God's word, sensing his own inadequacy. But the angel commanded 'Read.' So far as we know, Muhammad was unable to read or write, but he began to dictate those inspired words which would soon revolutionize a large segment of the earth: 'There is one God.' "In all things Muhammad was profoundly practical. When his beloved son Ibrahim died, an eclipse occurred, and rumours of God's personal condolence quickly arose. Whereupon Muhammad is said to have announced, 'An eclipse is a phenomenon of nature. It is foolish to attribute such things to the death or birth of a human being. "At Muhammad's own death an attempt was made to deify him, but the man who was to become his administrative successor killed the hysteria with one of the noblest speeches in religious history: 'If there are any among you who worshipped Muhammad, he is dead. But if it is God you worshipped, He lives forever." --James A. Michener, "Islam: The Misunderstood Religion," in READER'S DIGEST (American edition), May 1955, pp. 68-70. "Everything made so much sense. This is the beauty of the Qur'an; it asks you to reflect and reason....When I read the Qur'an further, it talked about prayer, kindness and charity. I was not a Muslim yet, but I felt the only answer for me was the Qur'an and God had sent it to me." Cat Stevens (Yusuf Islam), former British pop star. Ahmed Versi, editor of the weekly Muslim News, said the growth of Islam has been constant: "The younger generation of Muslims that I have encountered is becoming more aware of its Muslim identity and is therefore practising its faith with vigour." "I have always held the religion of Muhammad in high estimation because of its wonderful vitality. It is the only religion which appears to me to possess that assimilating capacity to the changing phase of existence which can make itself appeal to every age. I have studied him - the wonderful man and in my opinion for from being an anti-Christ, he must be called the Saviour of Humanity. I believe that if a man like him were to assume the dictatorship of the modern world, he would succeed in solving its problems in a way that would bring it the much needed peace and happiness: I have prophesied about the faith of Muhammad that it would be acceptable to the Europe of tomorrow as it is beginning to be acceptable to the Europe of today." --G.B. Shaw, THE GENUINE ISLAM, Vol. 1, No. 81936. "The extinction of race consciousness as between Muslims is one of the outstanding achievements of Islam, and in the contemporary world there is, as it happens, a crying need for the propagation of this Islamic virtue." --A.J. Toynbee, CIVILIZATION ON TRIAL, New York, 1948, p. 205. "The rise of Islam is perhaps the most amazing event in human history. Springing from a land and a people like previously negligible, Islam spread within a century over half the earth, shattering great empires, overthrowing long established religions, remoulding the souls of races, and building up a whole new world" - world of Islam. "The closer we examine this development the more extraordinary does it appear. The other great religions won their way slowly, by painful struggle and finally triumphed with the aid of powerful monarchs converted to the new faith. Christianity had its Constantine, Buddhism its Asoka, and Zoroastrianism its Cyrus, each lending to his chosen cult the mighty force of secular authority. Not so Islam. Arising in a desert land sparsely inhabited by a nomad race previously undistinguished in human annals, Islam sallied forth on its great adventure with the slenderest human backing and against the heaviest material odds. Yet Islam triumphed with seemingly miraculous ease, and a couple of generations saw the Fiery Crescent borne victorious from the Pyrenees to the Himalayas and from the desert of Central Asia to the deserts of Central Africa." --A.M.L. Stoddard, quoted in ISLAM - THE RELIGION OF ALL PROPHETS, Begum Bawani Waqf, Karachi, Pakistan, p. 56. "I am not a Muslim in the usual sense, though I hope I am a "Muslim" as "one surrendered to God," but I believe that embedded in the Quran and other expressions of the Islamic vision are vast stores of divine truth from which I and other occidentals have still much to learn, and 'Islam is certainly a strong contender for the supplying of the basic framework of the one religion of the future.'" --W. Montgomery Watt, ISLAM AND CHRISTIANITY TODAY, London, 1983, p. ix. 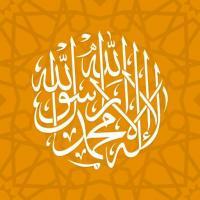 'I believe in One God and Mohammed the Apostle of God,' is the simple and invariable profession of Islam. The intellectual image of the Deity has never been degraded by any visible idol; the honours of the prophet have never transgressed the measure of human virtue, and his living precepts have restrained the gratitude of his disciples within the bounds of reason and religion." --Edward Gibbon and Simon Ocklay, HISTORY OF THE SARACEN EMPIRE, London, 1870, p. 54. "He was Caesar and Pope in one; but he was Pope without Pope's pretensions, Caesar without the legions of Caesar: without a standing army, without a bodyguard, without a palace, without a fixed revenue; if ever any man had the right to say that he ruled by the right divine, it was Mohammed, for he had all the power without its instruments and without its supports." --Bosworth Smith, MOHAMMAD AND MOHAMMADANISM, London, 1874, p. 92. "The doctrine of brotherhood of Islam extends to all human beings, no matter what color, race or creed. Islam is the only religion which has been able to realize this doctrine in practice. Muslims wherever on the world they are will recognize each other as brothers." Mr. R. L. Mellema, Holland, Anthropologist, Writer and Scholar. "The essential and definite element of my conversion to Islam was the Qur'an. I began to study it before my conversion with the critical spirit of a Western intellectual .... There are certain verses of this book, the Qur'an, revealed more than thirteen centuries ago, which teach exactly the same notions as the most modern scientific researches do. This definitely converted me." Ali Selman Benoist, France, Doctor of Medicine. "I have read the Sacred Scriptures of every religion; nowhere have I found what I encountered in Islam: perfection. The Holy Qur'an, compared to any other scripture I have read, is like the Sun compared to that of a match. I firmly believe that anybody who reads the Word of Allah with a mind that is not completely closed to Truth, will become a Muslim." Saifuddin Dirk Walter Mosig, U.S.A.
"The universal brotherhood of Islam, regardless of race, politics, color or country, has been brought home to me most keenly many times in my life -- and this is another feature which drew me towards the Faith." Col. Donald S. Rockwell, U.S.A. Poet, Critic and Author. "Medieval Islam was technologically advanced and open to innovation. It achieved far higher literacy rates than in contemporary Europe; it assimilated the legacy of classical Greek civilization to such a degree that many classical books are now known to us only through Arabic copies. It invented windmills ,trigonometry, lateen sails and made major advances in metallurgy, mechanical and chemical engineering and irrigation methods. In the middle-ages the flow of technology was overwhelmingly from Islam to Europe rather from Europe to Islam. Only after the 1500's did the net direction of flow begin to reverse." (pg 253) Jared Diamond a world renowned UCLA sociologist, and physiologist who won the Pulitzer Prize for his book: "Guns, Germs, and Steel."